Constant heavy downpours, a thick layer of mineral grain deposits, improper installs and even winter ice slides can all cause the sagging of gutters. Ideally, clip hangers are installed that prevent unwanted bending of the edge contour. They are designed to release with weight. To re-attach, the outer edge of the gutter is popped back on. This saves the gutter. 1) Tap the loosened nail head(s) back in with a hammer, pointing any completely removed tips back in their holes. This should be done from a ladder. 2) Produce a gutter hanger (1/4" nut head) and these are normally at 5" depth. 3) Rotate the hanger to effect a retainer between the hanger hook, and the outer gutter. 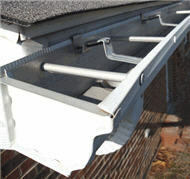 The drip edge could have to be lifted, to push the fold onto the gutter wall - noting that the picture illustrates a high drip edge, not uncommon toward the ends of gutter runs. Place the fold over the gutter edge - which may or may not be feasible depending on how high the drip edge happens to be from the top of the gutter, and whether it gives with any flex. If space will not allow this, screw the folded side doubled up. The hanger screws aren't necessarily intended for penetrating metal and drilling small pilot holes will help to initiate the penetration. Mount the hangers into the fascia. Finish securing them after they are all positioned. 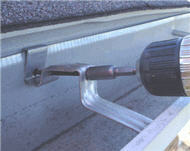 4) Make sure the level slopes: at a minimum 1/16" per foot for standard gutters as it is being set. With longer runs sloped from the middle. The load should be distributed across the hangers.